League of United Latin American Citizens Office of: IOWA STATE DIRECTOR REPORT TO SUPREME COUNCIL... continued In Education Marycrest College of Deavenprt has set up their first Latin American Scholarship. This scholarship is for four years and in to be awarded annually to some deserving latin American of the Quad-City Area. St. Ambrose College instituted a tuition grant program and seven Mexican Americans were enrolled there under this program. This program will be repeated annually. loras and Clarke College of Dabuque, Iowa are in the process of setting up a four year scholarship for a deserving Mexian American of Iowa. I have been communicating with the University of Iowa and Iowa State about the possibility of a four year scholarship for some worty S Latin American of Iowa. On March 2 1969 I was invited to speak at the Uniterian Church in Iowa City, Iowa. This is where the University of Iowa is located. I explained the aims and purpose of LULAC to this Church group which numbered about 60 people. 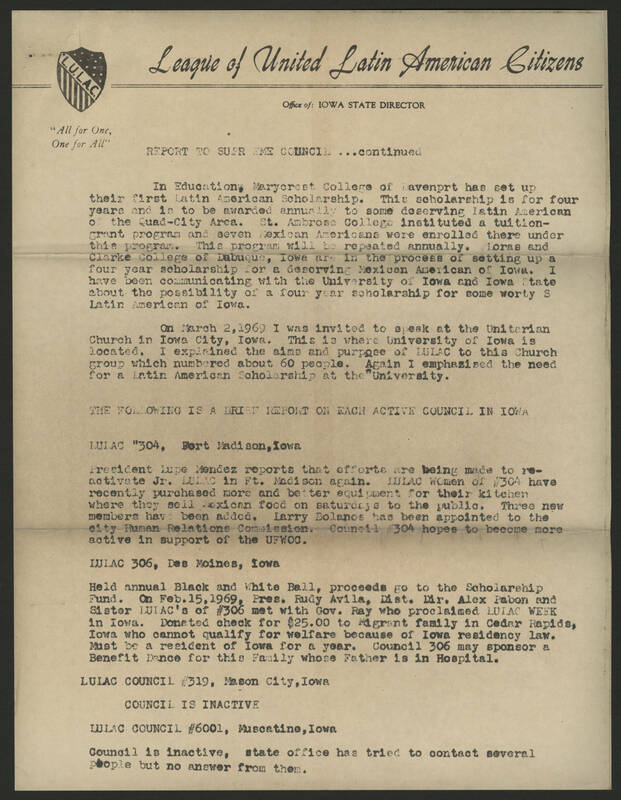 Again i emphasized the need for a Latin American Scholarship at the University THE FOLLOWING IS A BRIEF REPORT ON EACH ACTIVE COUNCIL IN IOWA LULAC " 304 Fort Madison, Iowa President Lupe Mendez reports that efforts are being made to reactivate Jr. LULAC in Ft. Madison again. LULAC Women of #304 have recently purchased more and better equipment for their kitchen where they sell Mexican food on saturdays to the public. Three new members have been added. Larry Bolanos has been appointed to the city Human Relations Commission. Council "304 hopes to become more active in support of the UFWOO LULAC 306, Des Moines, Iowa Held annual Black and White Ball, proceeds go to the Scholarship Fund. On Feb. 15, 1969, Pres. Rudy Avila, Dist. [Dir.] Alex Pabon and Sister LUIAC's of # 306 met with gov. ray who proclaimed LULAC WEEK in Iowa. Donated check for $25.00 to Migrant family in Cedar Raids, Iowa who cannot qualify for welfare because of Iowa Residency law. Must be a resident of Iowa for a year. Council 306 may sponsor a Benefit D[e]nce for this Family whose Father is in Hospital. LULAC Council #319, Mason City, Iowa COUNCIL IS INACTIVE LULAC COUNCIL #6001, Muscatine, Iowa Council is inactive, state office has tried to contact several people but no answer from them.